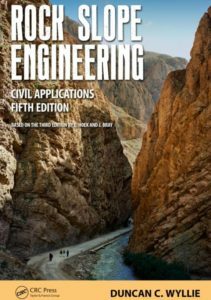 Over the past couple of months I have been working my way through the new book authored by Duncan Wyllie, “Rock Slope Engineering Civil Applications Fifth Edition”. The book format at 620 pages is readable on an aeroplane. However it should be on the desk of all engineers involved with rock slope engineering; it is an essential reference. The description Fifth Edition suggests a pedigree. The first edition of “Rock Slope Engineering” was authored by Evert Hoek and John Bray, who were then faculty at Imperial College of Science and Technology, London, England. Their book was published by The Institution of Mining and Metallurgy in 1974. It became available while I was a graduate student at University of Auckland, and I recall using it to help with understanding of rock slope problems we were working on. In 1979 I visited London. At a bookstore near Imperial College I paid £10 (the price tag is still on the inside cover) for a copy of “Rock Slope Engineering Revised Second Edition” published in 1977. It became a very necessary reference when working on rock slope problems. The Third Edition of “Rock Slope Engineering” was published in 1981. I am not sure why that is missing from my library. 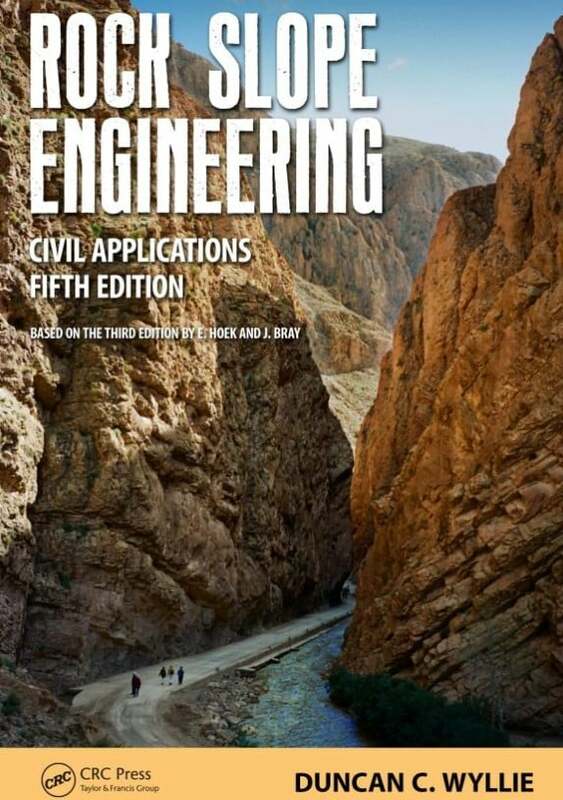 In 2004 I purchased the then new Fourth Edition titled “Rock Slope Engineering Civil and Mining”. There was a change in authors (Duncan Wyllie and Chris Mah) and publisher (Spon Press). The Fourth Edition quickly displaced the well-worn Second Edition that I had been using since 1979. That brings us to 2017 and the Fifth Edition, with a change in publisher (CRC Press) and Duncan Wyllie as sole author. There is also a change in title; mining is left off. Dr Wyllie explains the background to that in the Introduction, however it does not mean the book is no longer relevant to geotechnical engineers working in open pit mines – they should have a copy nearby. As well as updating and expanding on materials covered in the earlier editions of “Rock Slope Engineering”, there are new chapters on Weathered rock and Seismic design. The chapter on Numerical analysis is significantly updated and expanded, with an example of the use of TSLOPE in Chapter 9 (refer Figure 9.21). Dr Wyllie is to be congratulated on completing such a significant update of an important reference book.